Russian surface-to-air missile. 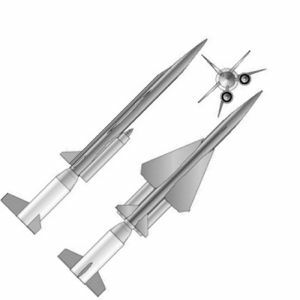 Tupolev design for a long-range air-breathing surface-to-air missile. Never got beyond the design stage. AKA: 131;Z. Status: Cancelled 1960. Payload: 190 kg (410 lb). Gross mass: 2,960 kg (6,520 lb). Height: 9.60 m (31.40 ft). Span: 2.41 m (7.90 ft). Apogee: 30 km (18 mi). Tupolev's OKB-16 became involved in surface-to-air missile design at the end of the 1950's with the Tu-131 project, also designated '131' or 'Z' (for Zenith). This was to be an unmanned long range interceptor, equivalent to the American Bomarc. The two stage surface-to-air missile's cruise stage was to be powered by one or two Bondaryuk ramjets. The design, and the competing MiG P-500, never got beyond the project design stage. The missile would have been 9.6 m long, with the cruise stage having a length of 7 m. The vertical fins were canted at a sixty degree angle. Total launch mass was 2960 kg, with the cruise stage weighing in at 1460 kg including the 190 kg warhead. The missile was capable of cruising at 4300 kph, reaching altitudes of 30 km, and would have had a range of 300 to 350 km. Maximum range: 350 km (210 mi). Boost Propulsion: Solid rocket. Maximum speed: 4,300 kph (2,600 mph). Family: surface-to-air, vehicle-launched. Country: Russia. Agency: Tupolev bureau. Bibliography: 571.